Probably still not good enough, even with Gush. I dunno. It is a 2R do-nothing on it's lonesome, and that's pretty bad. However, Git probing for 2 each time seems pretty amazing for a card that's good already. Double-bolt or double-REB seems fine. Heck, you can even double flusterstorm or double force something in a pinch. And, it leaves your yard intact the whole time. The "You still pay its costs" is the dagger. It could be good in a deck filled with 4x. Thing is, big blue plays lots of 1x, and decks with 4x (like delver) play too few mana for this. It's also bad with counterspells: you can play 2 fows, but at the same time, and against the same target losing 2 blue cards (plus fow). Good luck having for 2 drains. And if you are playing 1 fluster, it's unlikely that you want 2. Against mud you cannot play twice the costs. Against dredge also seems bad. I don't like it at all for vintage. Might be playable in legacy burn or something, but even there you might be better off just playing 4 other burn spells. 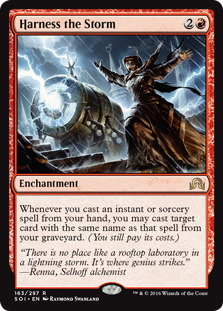 I could also see legacy storm maaaaaybe finding a use for it? But past in flames is still probably better. The only place this is going to work is in modern in Pyromancers ascension since it lets you cantrip so very hard. In a format that has a bunch of one ofs this is far less impressive. The fact that it doesn't exile those spells is really interesting. This + Yawg's allows you to cast a 4 of 11 times*, plus any times you regrow or copy the spell. * Once for the first time playing it (1). Three more for the other physical copies of the card(4). Three more for the copies those copies allow you to cast (7). Four more for casting them all with Will(11). Could this card make Treasure Cruise / Dig Through Time better in storm since it makes their non-bo with Yawg's Will less painful? You can't lose two blue cards and do two alternate costs. You HAVE to pay for the spell. Are you sure? The wording makes me understand I can pay the costs, the regular or the alternative. This is not as snapcaster with flashback, since there you are not paying the spell cost. Here you are, and you can choose if you want to pay the second fow with mana or with a blue card from your hand and a life. Yep, Xouman has it right. Harness puts no conditions on HOW you cast the card from your yard, only that you may cast them. Now, some effects, like Suspend, will have a problem with this because they only work from your hand. But Force of Will? Seems fine. First I thought this card made mana, then I read the reminder text. I can't see this working too well except in something that casts Rituals and similar cards. It does somewhat make card advantage if you have the mana already. Don't really see it working, especially considering it compares pretty unfavorably to Pyromancer Ascension. This is poop in Vintage. My Modern burn deck will LOVE this. Modern burn is viable in that format, it just lacked CA if you got drawn out into a mid-game....problem solved!